Purpose – The purpose of this paper is to contribute information and recommendations that could better equip emergency managers to prepare for and respond to emergencies and disasters, with a focus on improving their decision-making capabilities during response. Design/methodology/approach – A questionnaire-based survey approach was used in this research and 48 different local government organisations participated. These results were examined in conjunction with contemporary emergency management decision-making literature. A combination of closed and open ended questions was used, enabling qualitative and quantitative analysis. Findings – Results suggest that while there is information available about decision making, not all emergency managers are aware of the existence of this information or understand its relevance to emergency management. It is likely that those who did have a comprehensive understanding of decision making had gained this knowledge through non-emergency management-related courses. In total, 71 percent of participants said they would be interested in receiving more support regarding training and practice for decision making in Emergency Operations Centres. Originality/value – A wide body of research has investigated decision-making styles. 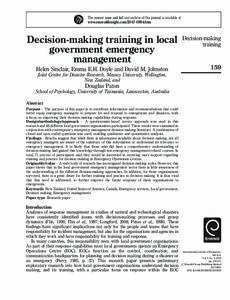 However, this paper shows that in the local government emergency management sector there is little awareness of the understanding of the different decision-making approaches. In addition, for those organisations surveyed, there is a great desire for further training and practice in decision making. It is thus vital that this need is addressed, to further improve the future response of these organisations to emergencies.